Ever on the lookout for how they can make scientists' lives easier, members of the Scientific Computing Division continually explore ways to provide researchers with more effective access to the laboratory's computer systems. One of these undertakings is a project called FermiCloud, which aims to develop easy-to-use computing in two different but related areas: cloud services and virtualized machines. "When we first proposed it in 2009, it was a bit of a radical idea," said Keith Chadwick, head of the Grid and Cloud Computing Department. "Now the user community is becoming more and more comfortable with it." Fermilab is investigating a number of virtualization services, including FermiCloud, for use at the laboratory. A virtualized machine mimics the workings of a physical computer. It is built not from circuits and chips but from software and applications (which in turn run on hardware). One physical computer can run multiple virtual machines, each of which is tailored for a specific science investigation, allowing extremely effective use of available computing resources. "You can support 10 different developers with different environments on one box," said Ruth Pordes, associate head of the Computing Division for Grids and Outreach. In addition to providing virtualized machines, FermiCloud gives scientists a way to interact through a cloud interface. Cloud services are distributed over a network, rather than located on an isolated machine. Conveniently for the user, the responsibility for maintaining all the nuts and bolts in the cloud rests with the provider. The user can simply plug into the cloud and get to work. Users could lease cloud services, such as Amazon's EC2 cloud. One experiment at KEK in Japan has considered EC2, and Brookhaven National Laboratory used EC2 from 2008 to 2009 to perform software analyses. The main drawback with commercial clouds, however, is the high cost of moving data in and out of them—and high-energy physicists have plenty of data to move. FermiCloud is a private cloud and allows users to make full use of the existing Fermilab high-speed network infrastructure. "It's already connected to the big data stores that we have, so we don't have to pay the data movement costs that you'd have to with a commercial cloud," Chadwick said. Quick turnaround is another convenience. Rather than having to wait for weeks for new physical computers, users can be allocated computing on demand. This on-demand computer can be reconfigured for the next user when the previous user is finished. 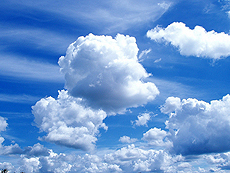 A cloud often grants users access to external clouds through a process called cloudbursting. The Korean Institute for Science and Technology Information, for example, plans to combine its resources with those in FermiCloud, extending one cloud into another. "It's very easy with FermiCloud to spin up a virtual machine, do a software test, gather the results, scratch your head a little bit to understand them and then repeat that process." Chadwick said. "It's all to help the scientists get the science done." LEAD — Scientists with the Long Baseline Neutrino Experiment have received the Department of Energy's approval to move forward with designs for a $50 million building that will eventually house a $250 million detector, and supporting infrastructure to be constructed in Kirk Canyon, for the first phase of what is expected to be an $867 million project. The multi-phased project will have scientists shooting a beam of neutrinos from Fermilab, near Chicago, to a specially constructed site in Kirk Canyon in Lead, where a neutrino detector will help scientists do preliminary studies about the properties of the subatomic particles. This sign marks areas at Fermilab with higher-than-normal ODH risk. Entering such areas requires training and adherence to special procedures. What does ODH stand for? The correct answer is E, but at Fermilab the answer that matters is D. Most of us are aware of the low-oxygen hazards at high elevations, either in the mountains or during airline travel. Oxygen displacing gases can have the same effects as high altitude. Oxygen deficiency can have serious consequences. At workplaces in the United States, the average annual fatality rate from oxygen-deficient atmospheres is 8.4 people. Fermilab, with its high awareness of the hazards of oxygen deficiency and its excellent safety assessment and training, has never suffered a serious oxygen deficiency injury. In some areas of the laboratory, Fermilab uses large amounts of gases and cryogenic liquids that would displace oxygen if released into the air we breathe. When warranted, these areas are clearly posted with a sign such as that shown above. Cryogenic liquids have the potential to fill large volumes with gas since they expand to 700 times their liquid volume upon release. To put this in perspective, a common 160-liter (about 42 gallons) nitrogen dewar could bring a 70-by-70-by-10-foot room below a safe level of 19.5 percent oxygen. Even large amounts of liquids and gases are safe, however, as long as they are contained and ventilation is provided. FESHM 5064 focuses on potential leaks into buildings and ventilation that could prevent the leaks from becoming dangerous. The risk of leaks, the ventilation system and the size of the room all factor into the ODH risk assessment. Risk class 0 means the ODH risk is no greater than common workplace hazards. Risk classes 1 and 2 are higher risks. Entering these areas requires training, oxygen monitors and adherence to other procedures to mitigate the hazard. These higher-risk areas are posted "Oxygen Deficiency Hazard" and are restricted to trained personnel. For further information please see FESHM 5064 or contact us at rlschmitt@fnal.gov or sanders@fnal.gov. A summary of the new guidance on conference-related activities and spending, titled DOE Update Guidance, has been posted on the Conference Travel page (right-hand sidebar) of the Fermilab Travel website. Exceptions provided in this guidance must be used sparingly, and the event must clearly meet the exemption definitions listed. When an exemption can be used for collaboration meetings led by Fermilab—for example, an LBNE collaboration meeting that meets the exception—please use the new Collaboration Exemption Request form (also posted in the right-hand side of the Conference Travel page). Please contact the Travel Office at x2952 or x8885 with any questions you may have regarding the new guidance.